The case in issue is People v. Miller, a recent case from the California Court of Appeal, Second Appellate District. In Miller, the Defendant was charged with assault with a deadly weapon among other felonies charges. On February 2, 2006, Glenn Fong was making a left turn onto First Street from Alamitos Avenue in Long Beach. His car was struck on the passenger side by a car being driven by Defendant. Fong and Defendant pulled their vehicles into a nearby gas station. Defendant said she did not want to get their insurance companies involved and offered to pay Fong $100. Fong rejected the offer. Fong went back to his car to get insurance and vehicle information and believed Defendant was doing the same. However, Defendant just sat in her car. After approximately ten minutes, Fong walked up to Defendant’s car to continue the exchange of information. Defendant was shivering and seemed agitated. She said: “I don’t remember who you are, I don’t know what I’m doing here.” Fong told her he was going to call the police. Defendant backed her vehicle into Fong’s car, which was partially blocking the exit, and fled the scene of the accident. Fong took down her license plate number and called the police. On the day of the accident, Robert Hamilton was working at the lifeguard headquarters on East Ocean Boulevard in Long Beach. Hamilton saw Defendant drive her vehicle down the beach access road, cross the sand, and turn onto the bicycle path. Hamilton got into his lifeguard truck and followed Defendant’s vehicle, staying to its right or left in order to keep his truck off the path. Hamilton’s truck was red and had the fire department insignia and his name on it. It was equipped with a light bar on top and a siren. He activated both and also used the truck’s air horn and public address system in his attempt to stop Defendant and to warn people to get off the path. Defendant, who had been going 25 to 35 miles per hour from the time she entered the bicycle path, did not stop or change her speed. Hamilton testified there were “a lot of people” on the bicycle path. He saw people jumping or diving off the path to get out of Defendant’s way. As Hamilton described it, “mothers were literally grabbing their children and jumping off the bike path.” He observed an elderly man climb up the bluff that bordered the path as Defendant approached. Defendant did not brake or slow down. At one point, the bicycle path intersected a parking lot, giving Defendant an opportunity to return to the road, but she continued on the path. Shortly after Defendant drove through the parking lot and back onto the bicycle path, her car hit Erick Martinez, who was jogging on the path, wearing headphones. Martinez fell backwards onto the hood of Defendant’s vehicle, and then back onto the bicycle path. The tires on Defendant’s vehicle rolled over his left side. Defendant drove her car a little farther before stopping. A bystander grabbed the keys. Upon emerging from her vehicle, Defendant said: “I didn’t see him.” Hamilton detained her and called the police. Jeffrey Shurtleff, the police officer who arrived to arrest Defendant, testified she appeared disoriented. Some of her statements did not make sense and her speech was slurred. She said she did not know why she was on the bike path. Officer Shurtleff ran Defendant’s driver’s license through his computer and learned that she had been driving on a suspended license or a revoked license. Defendant admitted knowing about the suspension or revocation. Officer Eric Mifflin, who conducted a field sobriety test, observed that Defendant’s eyes were jaundiced and she was shivering violently. Her breath gave off a chemical odor. Her eyes “bounce[d]” when she tried to track an object, a condition called “nystagmus,” which can be caused by substance abuse. According to Officer Mifflin, Defendant seemed incoherent when he first confronted her and “was kind of dazing in and out of a semiconscious state.” He concluded that “[s]he wasn’t sure where she was or what had happened.” Because of her physical condition, he decided to take her to the station to continue the sobriety testing. Once there, Defendant failed a number tests, including a balance test and a walking test. She admitted having drunk a half pint of vodka the previous night, but the breathalyzer did not detect any alcohol. The police nurse was unable to draw blood for testing. Martinez was taken to a hospital and released within a few hours. At the time of trial, a year after the incident, he still felt pain in his ankle, neck and lower back when he tried to jog. The defense called Dr. Angela LaMotte, Defendant’s primary care physician. Dr. LaMotte testified that nystagmus could also be caused by virus or injury. She further testified that Defendant suffered from a condition, “labrynthitis,” that affected her inner ear and could cause intermittent dizziness or vertigo. On appeal, the Defendant argued that the trial court’s instruction to the jury misdirected the jury on a necessary element of the offense, thereby violating the Defendant’s right to due process of law. Since the Court concluded that the error was not “harmless error,” the Court reversed the Defendant’s conviction and sent the case back to the trial court with instruction to retry the case. What this case illustrates is that, where a defendant is charged with assault, the prosecution must show more than that the defendant was “negligent.” Thus, for instance, in this case, if the jury had a reasonable doubt as to whether the Defendant saw the jogger or not before she hit him with her car, the jury should have been able to return a verdict of not guilty, since, as the Court of Appeal make clear, the Defendant cannot be convicted of assault because she was “negligent” for failing to see the jogger. If you or someone you love is being charged with a crime in Southern California, you should call Wallin & Klarich today for a free evaluation of your case. 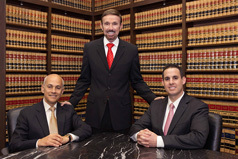 Call 1-888-749-0034 and visit us at www.wklaw.com.